The petitions being circulated by the fire union proposed charter amendments to cap the city manager's pay and tenure, reduce petition requirements and bind the city from filing suit against the police and fire union. “It has gone beyond the union bosses trying to get more money from the city; it is now about destroying the city’s ability to operate effectively,” he said. The city and the fire union have been in a disagreement over a wage and healthcare contract since the last contract expired in 2014. “The firefighter’s union has had an open invitation to meet at the negotiating table, unfortunately they refuse because one union prefers to perpetuate his own petty political drama at the expense and well being of both rank and file firefighters and the people of San Antonio,” Nirenberg said. Nirenberg said: “They have made that pretty clear” the petitions were retaliation from the fire union. Nirenberg was joined by Richard Perez, president of the San Antonio Chamber of Commerce, as well as Council members Rey Saldana, Ana Sandoval, Roberto Trevino, Shirley Gonzalez and Clayton Perry. “The ill guided petition rouse is clearly a political attempt by the fire union to punish our top notch city manager and our responsive mayor and City Council because they will not kowtow to the whims of the fire union bosses,” Perez said. Perez said the business community may develop an information plan of its own. “The business community is going to get very actively behind trying to educate the citizenry that the petitions that are being pushed by the union make no sense whatsoever and in fact hamstring the city’s ability to continue to grow long term,” he said. Chris Steele, the fire union's president, was at the news conference, recording it on his phone. He left without taking questions, saying he had no comments at that moment. 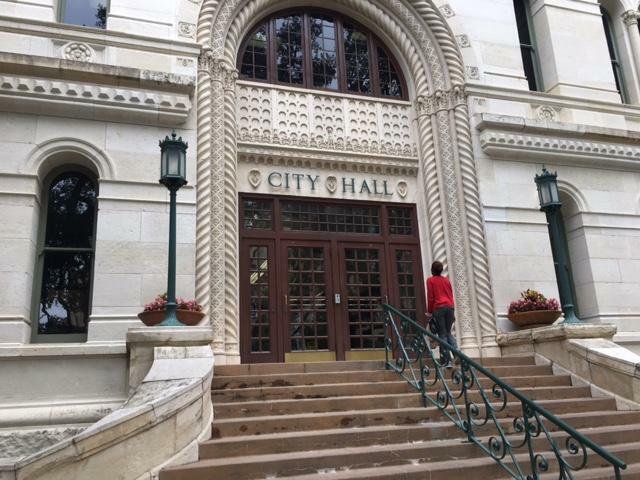 The San Antonio Professional Firefighters Association is circulating three petitions, proposing changes to the city’s charter that would cap the city manager’s salary and alter the petition process.